Almost 90 per cent of Sussex Police officers who responded to a Police Federation survey said morale within the force was low. And almost four out of five have faced mental wellbeing issues such as anxiety over the last 12 months. The federation, one of the largest staff associations in the UK, represents more than 119,000 constables, sergeants and inspectors and has been running for 100 years. 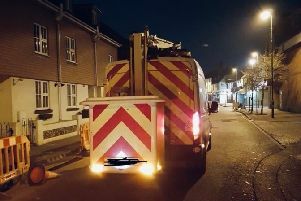 Its survey revealed that three-quarters of Sussex staff said their workload was too high or much too high, while four out of five said there were not enough officers to do the job properly. Those views were certainly reflected in the number of staff, officers and PCSOs employed by Sussex Police. At a meeting with Adur and Worthing councillors earlier this month, Police and Crime Commissioner Katy Bourne said there were 5,102 full time equivalent staff on the books at the end of March 2013, and 4,526 at the end of 2017/18. She added that some 150 staff left the force every year. Work is in place to address the issue, with more than 200 recruitments since last April and plans for up to 800 by 2022. The pressures placed on the current staff came through loud and clear in the survey, with sizeable rises in the percentage saying they were pressured to work long hours, and faced unrealistic time pressures and deadlines. Worryingly, when it came to staff’s mental wellbeing, Sussex Police scored below the national average in almost all areas. Little wonder given 19 per cent reported that they had suffered one or more injuries as a result of work-related violence in the last year. Almost two-thirds said they rarely or never felt relaxed, while just over one-third said they rarely or never felt optimistic about the future. Assistant Chief Constable Nick May said: “As an organisation we are aware how demanding a role in the police force can be and our officers are frequently asked to put themselves in situations that most people would shy away from. “We, like many others working in blue light services, are very good at caring for others but have, in the past, forgotten to care for our own staff in the way we should. “In recent years we have introduced a significant number of schemes and support mechanisms so our officers and staff can get the support and guidance they need. Looking at the national picture, Ché Donald, the federation’s national vice-chairman, said the results should be ‘a huge red flag to the government, chief constables and the public’.